I am pleased that we can meet at this point in the apostolic mission which has brought me to your country. I thank Cardinal Wuerl and Archbishop Kurtz for their kind words in your name. I am very appreciative of your welcome and the generous efforts made to help plan and organize my stay. As I look out with affection at you, their pastors, I would like to embrace all the local Churches over which you exercise loving responsibility. I would ask you to share my affection and spiritual closeness with the People of God throughout this vast land. Whenever a hand reaches out to do good or to show the love of Christ, to dry a tear or bring comfort to the lonely, to show the way to one who is lost or to console a broken heart, to help the fallen or to teach those thirsting for truth, to forgive or to offer a new start in God… know that the Pope is at your side and supports you. He puts his hand on your own, a hand wrinkled with age, but by God’s grace still able to support and encourage. My first word to you is one of thanksgiving to God for the power of the Gospel which has brought about remarkable growth of Christ’s Church in these lands and enabled its generous contribution, past and present, to American society and to the world. I thank you most heartily for your generous solidarity with the Apostolic See and the support you give to the spread of the Gospel in many suffering areas of our world. I appreciate the unfailing commitment of the Church in America to the cause of life and that of the family, which is the primary reason for my present visit. I am well aware of the immense efforts you have made to welcome and integrate those immigrants who continue to look to America, like so many others before them, in the hope of enjoying its blessings of freedom and prosperity. I also appreciate the efforts which you are making to fulfill the Church’s mission of education in schools at every level and in the charitable services offered by your numerous institutions. These works are often carried out without appreciation or support, often with heroic sacrifice, out of obedience to a divine mandate which we may not disobey. I am also conscious of the courage with which you have faced difficult moments in the recent history of the Church in this country without fear of self-criticism and at the cost of mortification and great sacrifice. Nor have you been afraid to divest whatever is unessential in order to regain the authority and trust which is demanded of ministers of Christ and rightly expected by the faithful. I realize how much the pain of recent years has weighed upon you and I have supported your generous commitment to bring healing to victims – in the knowledge that in healing we too are healed – and to work to ensure that such crimes will never be repeated. I speak to you as the Bishop of Rome, called by God in old age, and from a land which is also American, to watch over the unity of the universal Church and to encourage in charity the journey of all the particular Churches toward ever greater knowledge, faith and love of Christ. Reading over your names, looking at your faces, knowing the extent of your churchmanship and conscious of the devotion which you have always shown for the Successor of Peter, I must tell you that I do not feel a stranger in your midst. I am a native of a land which is also vast, with great open ranges, a land which, like your own, received the faith from itinerant missionaries. I too know how hard it is to sow the Gospel among people from different worlds, with hearts often hardened by the trials of a lengthy journey. Nor am I unaware of the efforts made over the years to build up the Church amid the prairies, mountains, cities and suburbs of a frequently inhospitable land, where frontiers are always provisional and easy answers do not always work. What does work is the combination of the epic struggle of the pioneers and the homely wisdom and endurance of the settlers. As one of your poets has put it, “strong and tireless wings” combined with the wisdom of one who “knows the mountains”. I do not speak to you with my voice alone, but in continuity with the words of my predecessors. From the birth of this nation, when, following the American Revolution, the first diocese was erected in Baltimore, the Church of Rome has always been close to you; you have never lacked its constant assistance and encouragement. In recent decades, three Popes have visited you and left behind a remarkable legacy of teaching. Their words remain timely and have helped to inspire the long-term goals which you have set for the Church in this country. It is not my intention to offer a plan or to devise a strategy. I have not come to judge you or to lecture you. I trust completely in the voice of the One who “teaches all things” (Jn 14:26). Allow me only, in the freedom of love, to speak to you as a brother among brothers. I have no wish to tell you what to do, because we all know what it is that the Lord asks of us. Instead, I would turn once again to the demanding task – ancient yet never new – of seeking out the paths we need to take and the spirit with which we need to work. Without claiming to be exhaustive, I would share with you some reflections which I consider helpful for our mission. We are bishops of the Church, shepherds appointed by God to feed his flock. Our greatest joy is to be shepherds, and only shepherds, pastors with undivided hearts and selfless devotion. We need to preserve this joy and never let ourselves be robbed of it. The evil one roars like a lion, anxious to devour it, wearing us down in our resolve to be all that we are called to be, not for ourselves but in gift and service to the “Shepherd of our souls” (1 Pet 2:25). The heart of our identity is to be sought in constant prayer, in preaching (Acts 6:4) and in shepherding the flock entrusted to our care (Jn 21:15-17; Acts 20:28-31). Ours must not be just any kind of prayer, but familiar union with Christ, in which we daily encounter his gaze and sense that he is asking us the question: “Who is my mother? Who are my brothers?” (Mk 3:31-34). One in which we can calmly reply: “Lord, here is your mother, here are your brothers! I hand them over to you; they are the ones whom you entrusted to me”. Such trusting union with Christ is what nourishes the life of a pastor. It is not about preaching complicated doctrines, but joyfully proclaiming Christ who died and rose for our sake. The “style” of our mission should make our hearers feel that the message we preach is meant “for us”. May the word of God grant meaning and fullness to every aspect of their lives; may the sacraments nourish them with that food which they cannot procure for themselves; may the closeness of the shepherd make them them long once again for the Father’s embrace. Be vigilant that the flock may always encounter in the heart of their pastor that “taste of eternity” which they seek in vain in the things of this world. May they always hear from you a word of appreciation for their efforts to confirm in liberty and justice the prosperity in which this land abounds. At the same time, may you never lack the serene courage to proclaim that “we must work not for the food which perishes, but for the food which endures for eternal life” (Jn 6:27). Shepherds who do not pasture themselves but are able to step back, away from the center, to “decrease”, in order to feed God’s family with Christ. Who keep constant watch, standing on the heights to look out with God’s eyes on the flock which is his alone. Who ascend to the height of the cross of God’s Son, the sole standpoint which opens to the shepherd the heart of his flock. Shepherds who do not lower our gaze, concerned only with our concerns, but raise it constantly toward the horizons which God opens before us and which surpass all that we ourselves can foresee or plan. Who also watch over ourselves, so as to flee the temptation of narcissism, which blinds the eyes of the shepherd, makes his voice unrecognizable and his actions fruitless. In the countless paths which lie open to your pastoral concern, remember to keep focused on the core which unifies everything: “You did it unto me” (Mt 25:31-45). Certainly it is helpful for a bishop to have the farsightedness of a leader and the shrewdness of an administrator, but we fall into hopeless decline whenever we confuse the power of strength with the strength of that powerlessness with which God has redeemed us. Bishops need to be lucidly aware of the battle between light and darkness being fought in this world. Woe to us, however, if we make of the cross a banner of worldly struggles and fail to realize that the price of lasting victory is allowing ourselves to be wounded and consumed (Phil 2:1-11). We all know the anguish felt by the first Eleven, huddled together, assailed and overwhelmed by the fear of sheep scattered because the shepherd had been struck. But we also know that we have been given a spirit of courage and not of timidity. So we cannot let ourselves be paralyzed by fear. I know that you face many challenges, that the field in which you sow is unyielding and that there is always the temptation to give in to fear, to lick one’s wounds, to think back on bygone times and to devise harsh responses to fierce opposition. And yet we are promoters of the culture of encounter. We are living sacraments of the embrace between God’s riches and our poverty. We are witnesses of the abasement and the condescension of God who anticipates in love our every response. Dialogue is our method, not as a shrewd strategy but out of fidelity to the One who never wearies of visiting the marketplace, even at the eleventh hour, to propose his offer of love (Mt 20:1-16). The path ahead, then, is dialogue among yourselves, dialogue in your presbyterates, dialogue with lay persons, dialogue with families, dialogue with society. I cannot ever tire of encouraging you to dialogue fearlessly. The richer the heritage which you are called to share with parrhesia, the more eloquent should be the humility with which you should offer it. Do not be afraid to set out on that “exodus” which is necessary for all authentic dialogue. Otherwise, we fail to understand the thinking of others, or to realize deep down that the brother or sister we wish to reach and redeem, with the power and the closeness of love, counts more than their positions, distant as they may be from what we hold as true and certain. Harsh and divisive language does not befit the tongue of a pastor, it has no place in his heart; although it may momentarily seem to win the day, only the enduring allure of goodness and love remains truly convincing. We need to let the Lord’s words echo constantly in our hearts: “Take my yoke upon you, and learn from me, who am meek and humble of heart, and you will find refreshment for your souls” (Mt 11:28-30). Jesus’ yoke is a yoke of love and thus a pledge of refreshment. At times in our work we can be burdened by a sense of loneliness, and so feel the heaviness of the yoke that we forget that we have received it from the Lord. It seems to be ours alone, and so we drag it like weary oxen working a dry field, troubled by the thought that we are laboring in vain. We can forget the profound refreshment which is indissolubly linked to the One who has made us the promise. We need to learn from Jesus, or better to learn Jesus, meek and humble; to enter into his meekness and his humility by contemplating his way of acting; to lead our Churches and our people – not infrequently burdened by the stress of everyday life – to the ease of the Lord’s yoke. And to remember that Jesus’ Church is kept whole not by “consuming fire from heaven” (Lk 9:54), but by the secret warmth of the Spirit, who “heals what is wounded, bends what is rigid, straightens what is crooked”. The great mission which the Lord gives us is one which we carry out in communion, collegially. The world is already so torn and divided, brokenness is now everywhere. Consequently, the Church, “the seamless garment of the Lord” cannot allow herself to be rent, broken or fought over. Our mission as bishops is first and foremost to solidify unity, a unity whose content is defined by the Word of God and the one Bread of Heaven. With these two realities each of the Churches entrusted to us remains Catholic, because open to, and in communion with, all the particular Churches and with the Church of Rome which “presides in charity”. It is imperative, therefore, to watch over that unity, to safeguard it, to promote it and to bear witness to it as a sign and instrument which, beyond every barrier, unites nations, races, classes and generations. May the forthcoming Holy Year of Mercy, by drawing us into the fathomless depths of God’s heart in which no division dwells, be for all of you a privileged moment for strengthening communion, perfecting unity, reconciling differences, forgiving one another and healing every rift, that your light may shine forth like “a city built on a hill” (Mt 5:14). This service to unity is particularly important for this nation, whose vast material and spiritual, cultural and political, historical and human, scientific and technological resources impose significant moral responsibilities in a world which is seeking, confusedly and laboriously, new balances of peace, prosperity and integration. It is an essential part of your mission to offer to the United States of America the humble yet powerful leaven of communion. May all mankind know that the presence in its midst of the “sacrament of unity” (Lumen Gentium, 1) is a guarantee that its fate is not decay and dispersion. This kind of witness is a beacon whose light can reassure men and women sailing through the dark clouds of life that a sure haven awaits them, that they will not crash on the reefs or be overwhelmed by the waves. I encourage you, then, to confront the challenging issues of our time. Ever present within each of them is life as gift and responsibility. The future freedom and dignity of our societies depends on how we face these challenges. The innocent victim of abortion, children who die of hunger or from bombings, immigrants who drown in the search for a better tomorrow, the elderly or the sick who are considered a burden, the victims of terrorism, wars, violence and drug trafficking, the environment devastated by man’s predatory relationship with nature – at stake in all of this is the gift of God, of which we are noble stewards but not masters. It is wrong, then, to look the other way or to remain silent. 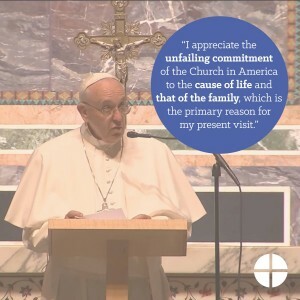 No less important is the Gospel of the Family, which in the World Meeting of Families in Philadelphia I will emphatically proclaim together with you and the entire Church. These essential aspects of the Church’s mission belong to the core of what we have received from the Lord. It is our duty to preserve and communicate them, even when the tenor of the times becomes resistent and even hostile to that message (Evangelii Gaudium, 34-39). I urge you to offer this witness, with the means and creativity born of love, and with the humility of truth. It needs to be preached and proclaimed to those without, but also to find room in people’s hearts and in the conscience of society. To this end, it is important that the Church in the United States also be a humble home, a family fire which attracts men and women through the attractive light and warmth of love. As pastors, we know well how much darkness and cold there is in this world; we know the loneliness and the neglect experienced by many people, even amid great resources of communication and material wealth. We see their fear in the face of life, their despair and the many forms of escapism to which it gives rise. Consequently, only a Church which can gather around the family fire remains able to attract others. And not any fire, but the one which blazed forth on Easter morn. The risen Lord continues to challenge the Church’s pastors through the quiet plea of so many of our brothers and sisters: “Have you something to eat?” We need to recognize the Lord’s voice, as the apostles did on the shore of the lake of Tiberius (Jn 21:4-12). It becomes even more urgent to grow in the certainty that the embers of his presence, kindled in the fire of his passion, precede us and will never die out. Whenever this certainty weakens, we end up being caretakers of ash, and not guardians and dispensers of the true light and the warmth which causes our hearts to burn within us (Lk 24:32). Before concluding these reflections, allow me to offer two recommendations which are close to my heart. The first refers to your fatherhood as bishops. Be pastors close to people, pastors who are neighbors and servants. Let this closeness be expressed in a special way towards your priests. Support them, so that they can continue to serve Christ with an undivided heart, for this alone can bring fulfillment to ministers of Christ. I urge you, then, not to let them be content with half-measures. Find ways to encourage their spiritual growth, lest they yield to the temptation to become notaries and bureaucrats, but instead reflect the motherhood of the Church, which gives birth to and raises her sons and daughters. Be vigilant lest they tire of getting up to answer those who knock on their door by night, just when they feel entitled to rest (Lk 11:5-8). Train them to be ready to stop, care for, soothe, lift up and assist those who, “by chance” find themselves stripped of all they thought they had (Lk 10:29-37). My second recommendation has to do with immigrants. I ask you to excuse me if in some way I am pleading my own case. The Church in the United States knows like few others the hopes present in the hearts of these “pilgrims”. From the beginning you have learned their languages, promoted their cause, made their contributions your own, defended their rights, helped them to prosper, and kept alive the flame of their faith. Even today, no American institution does more for immigrants than your Christian communities. Now you are facing this stream of Latin immigration which affects many of your dioceses. Not only as the Bishop of Rome, but also as a pastor from the South, I feel the need to thank and encourage you. Perhaps it will not be easy for you to look into their soul; perhaps you will be challenged by their diversity. But know that they also possess resources meant to be shared. So do not be afraid to welcome them. Offer them the warmth of the love of Christ and you will unlock the mystery of their heart. I am certain that, as so often in the past, these people will enrich America and its Church. May God bless you and Our Lady watch over you! This update courtesy of Vatican Information Service.